The pictures is primitive at best. Obviously, the image of a dog. 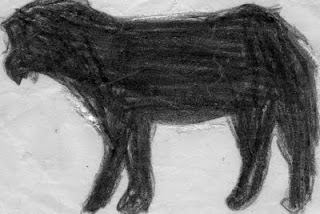 The tattered piece of paper had been kept for a reason unknown to me, only known to the artist who, with crayon, drew the black dog. At the top of the paper, in cursive, was in my mother penmanship her name. I came across this picture tucked in her old photo album. The paper is yellowed, tattered. Why did she keep this piece of art? This picture is a treasure found between pages. It is the only art I have seen from my mother's hand. A piece of paper that allows me to see a part of her I didn't know. A budding artist who left her dreams to work hard on the farm raising her daughters, feeding farm hands and caring for the man she had always loved. Dreams for farm women were just that, dreams. I know that Mom wanted to go to college. She was smart, creative and had a father who was not about to spend money to educate a girl. A few women who lived around Neff Road had gone on to become secretaries, school teachers. And, many of those same women still ended up in the kitchen and in the field, their dreams put away in order to give their man his life as a farmer. Dreams. I'm sad that my mother never had the opportunity to follow her dreams. Her life was full. She gave it everything thing she had including her health. She didn't complain or look back verbally to the 'what ifs'. Mom made her life about others. She gave and gave. Sometimes I wonder if she gave so passionately in order to put her dreams behind her. This small piece of paper, this unknown dog, gives me a glimpse into the woman my mother might have been had she had the right to follow her dreams. For all of the power I knew that was my mother, she could have done great things. And, in her way, putting her dreams aside, she did great things. Mom should have been an ambassador. She could have changed the world.....and in her own way, she changed the world for many. Who were you little dog? Were you a pet she loved? We you an idea that my mother put onto paper trying her hand at drawing? Whatever you were, little dog, you are a piece of my mother, a piece I didn't know. Along with pieces drawn by my hand, you will move on to tell a story to other generations. A drawing by my mother's hand.